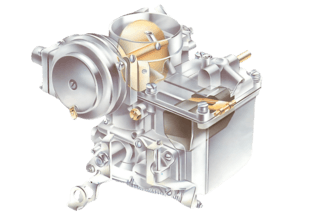 The SU is the simplest type of variable jet carburettor, the other main type, the Stromberg, has a rubber diaphragm instead of a piston. Low vacuum in the piston chamber. Operating the choke lowers the jet, which allows more fuel to be drawn in. An engine needs an extra-rich mixture more petrol, less air for starting from cold. On some variable-jet carburettors, this is provided for by the jet being lowered a short way, so that it is less blocked by the needle and dispenses more fuel than usual. On others, neat fuel is atomised by the rotation of a disc of progressively larger-sized holes. 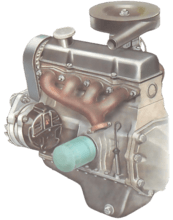 On a fixed-jet carburettor (See How the fuel system works - fixed-jet carburettors) the opposite happens: instead of more petrol being supplied to the carburettor, the air supply is partly blocked off by a choke flap above the throttle. However, both systems are referred to as 'choke' mechanisms, or cold-start enrichment systems. 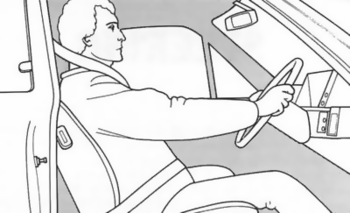 On some cars you have to set the choke yourself before starting, usually by means of a pull-push control in the dashboard, or steering column or floor pan. Other cars have an automatic choke which uses a bimetallic coiled strip a strip made of two different metals brazed together attached to the choke lever. When the engine is cold, the choke is 'on'. As the engine warms, so does the strip. It expands with heat, but one of the metals expands more than the other, so that the coiled strip bends and uncurls and progressively moves the choke lever to 'off. For a carburettor to maintain a steady fuel flow, it needs to draw on a supply of fuel which is always kept at the same level. That supply is provided by a float chamber attached to the carburettor. The float chamber contains a pivoted float which bears against a needle valve through which fuel enters the chamber. When the float drops, the needle valve opens. As the fuel level in the chamber rises so does the float, until, at a pre-set level, the needle closes.